Over the past seven decades, since the General Agreement on Tariffs and Trade (GATT) was established in 1947, there has been a phenomenal increase in international trade in goods, largely due to sustained efforts by the world's main trading nations to reduce and eliminate tariff barriers in a multilaterally orchestrated manner. This publication reviews how the procedures and practices relating to tariff negotiations and renegotiations have evolved over this time. In particular, this new edition recounts how negotiations to expand the duty-free coverage of the Information Technology Agreement were concluded and provides an account of tariff renegotiations regarding successive enlargements of the European Union. It also covers tariff negotiations for the accession of a number of new members to the WTO, such as China and Russia. 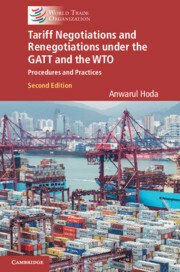 This book will be of particular interest to negotiators, members of government, trade ministries, economists and academics specialized in trade policy.